Ms. Rachel was the first North Augustan my wife and I encountered on the day we drove over to look at houses to decide if we wanted to make the city our home. She is a gracious and friendly lady, she almost alone convinced us. The time comes in everyone’s life to move on and seek other endeavors, avocations and hobbies and in that I wish Kenny and Rachael Godspeed and much happiness. The SNO-CAP is one of those little pieces of community that seem to disappear from the landscape daily, replaced by conglomerates, chains and sameness. I am told Fat Man’s is good. 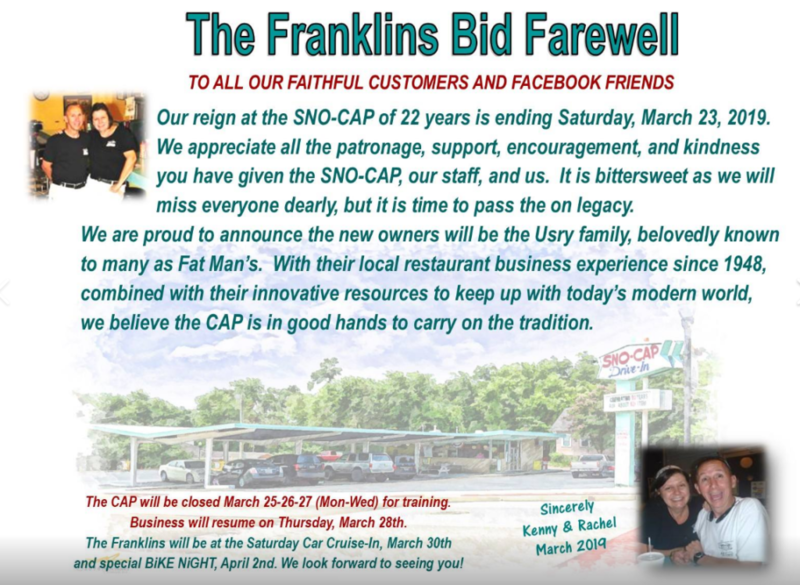 I sincerely hope that they bring what is good of that operation and intertwine it with the uniqueness of the legacy and community of the SNO-CAP. I would also hope, as I hoped from the beginning, that the people that run the Green Jackets will wake up and include the SNO-CAP among their food choices. If one wants to truly be part of the community you have to embrace the community. Good luck Kenny and Rachel – thank you for the hospitality, the food and the piece of the community that you had stewardship over.